tweets with a statement that the perpetrator was a “former employee who was not currently authorized to use the park’s account.” Apparently viewing the official response as censorship, other official federal Twitter accounts responded not by going silent, but rather by tweeting their own resource advocacy messages. Among them was Death Valley National Park, which tweeted the next day about its connection to Japanese-American internment. Given the contemporary debate on immigration and other social issues, the historical parallels were apparent. The resistance appeared not only from official social media accounts, but also from unofficial, or “rogue,” social media handles purportedly controlled by federal workers on their personal time. Within days, National Public Radio reported that “rogue” federal Twitter accounts had multiplied—more than 80 of them appeared altogether. 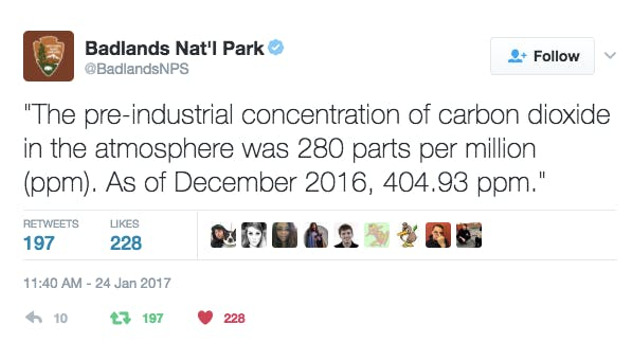 And while many promoted science and environmental concerns, the “alt” accounts also advocated for our nation’s cultural heritage at places such as Statue of Liberty (@AltStatLiberty); National Endowment for the Humanities (@RogueNEH); Homestead National Monument (@AltHomesteadMon); and Herbert Hoover National Historic Site (@AltHooverNPS), just to name a few. Like many Twitter handles, some of these voices have gone silent in the year since they first appeared, but others continue to prosper with tens of thousands of followers. Perhaps the most prominent of all the rogue accounts is @altnps, which dubs itself the “official ‘Resistance’ team of the U.S. National Park Service” and carries forward the movement with nearly 100,000 follows as of January 2018. The new political reality provides no shortage of material for the accounts to work with. With budget proposals promising to reduce such things as federal grant funding to museums and historic sites, executive orders reducing or eliminating national monuments, directives substantially increasing NPS entrance fees, American waters being drastically opened to off-shore drilling, and so much more, one can expect the social media resistance to continue. Indeed, cultural institutions with a robust social media presence, official or otherwise, have demonstrated that their voices can be heard by a worldwide audience and that they carry both perspective and authority. If delivered in a timely and calculated fashion, this dialogue can lend weight to the issues of the day and help ensure an organization’s relevance in these uncertain times. One Twitter feed that we can guarantee won’t be silenced is ours. Follow us @NextExitHistory.